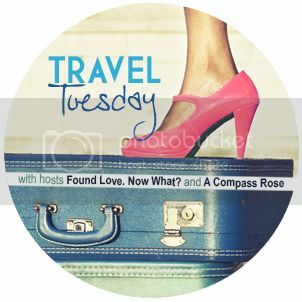 Welcome back to Travel Tuesday! 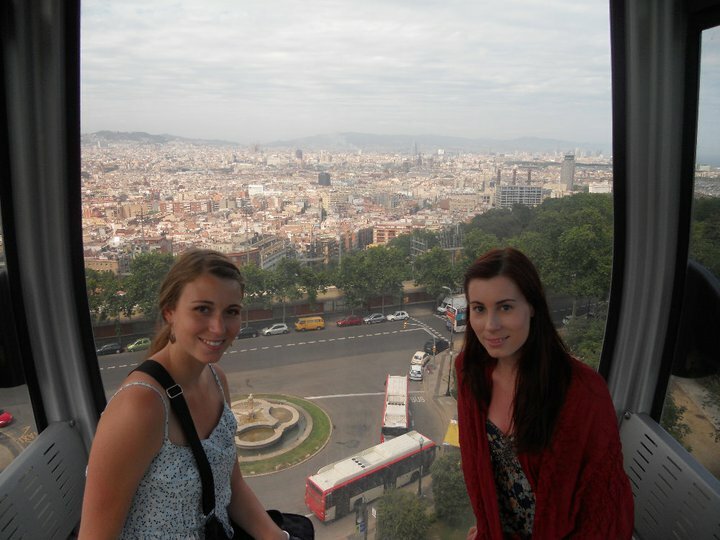 This week I'm reliving my adventures in Barcelona, Spain. 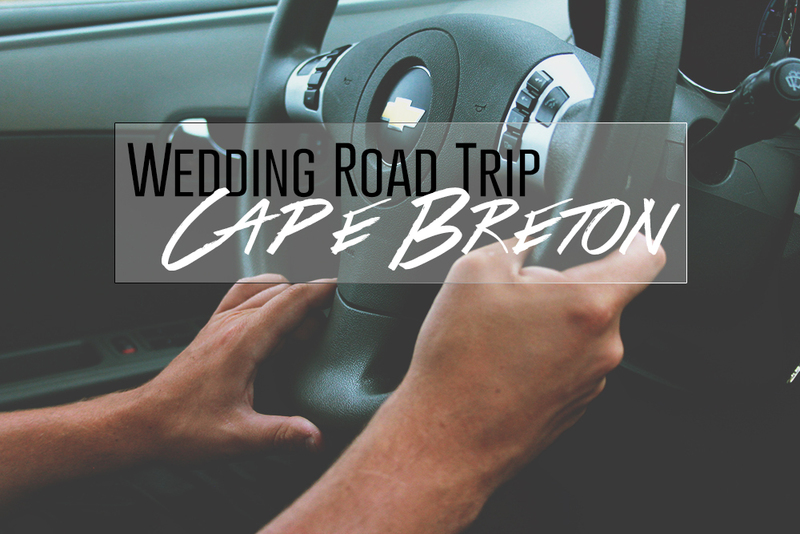 If you haven't read last weeks post, you can catch up here, since we'll be picking up where we left off! As I said last week, Barcelona was a bit of a bumpy stop! The World football championships (Soccer football, not NFL football) were taking place while we were visiting, so Barcelona was perhaps a little more chaotic than usual. Our first bump in the road here began the second we arrived. As I shared last week, there was no overnight train from Nice to Barca (why!? seriously, its a 13 hour journey. Why is there no night train!?) so we had to arrive either one night early, or one night late. We chose to arrive early, even though we didn't have a hostel, and just cross our fingers that we could find one. Unfortunately, this didn't work. We met some Spanish friends on the train over who spoke English fairly well, and they tried to help us find a hotel, but unfortunately nothing was available. We arrived at about 1am, so most hostel's were closed for the night. Luckily we had taken the train with a guy who we met in Nice, so we weren't totally alone. So what are three people to do when stuck in Barcelona without a room? Sleep in the park, apparently. Yup, we decided to camp out in the park, with nothing but our towels and a rain sheet. Of course it rained while we were sleeping under the stars, so we got a little wet. Luckily no other trouble came of sleeping in the open (seriously, we could have been mugged and we had everything on us. I realize how stupid this was, don't worry) And bright and early the next morning we headed to our hostel hoping to check in early and take a shower. Upon arrival at our hostel, we were told we could leave our bags in their locker room, but that our rooms wouldn't be available until that afternoon. We decided to leave our things and start exploring the city, so we took our purses and left our heavy backpacks at the hostel. worst decision we made on that trip. My little notebook laptop was missing from our bag when we returned, despite having locked in in a 'locker room'. This makes me fairly suspicious that the people working at the hostel stole our laptop, but of course they took no responsibility and gave not a single crap. 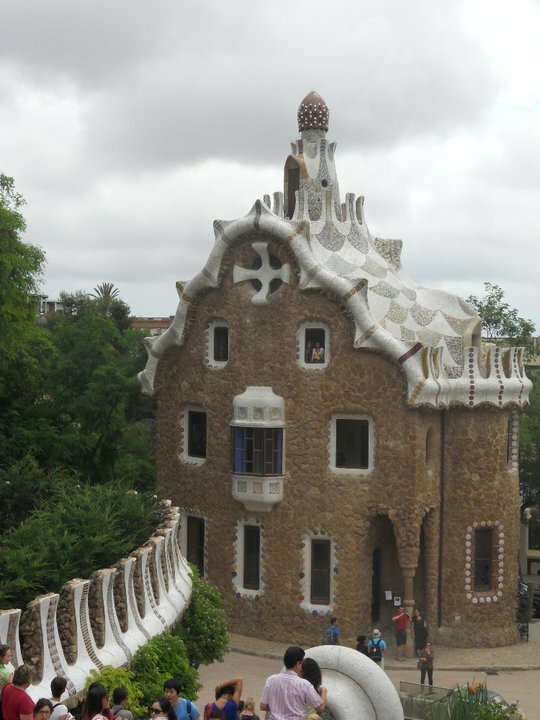 The hostel was Alberg Barcelona Pere Tarres, and I do not recommend it. So, sleep deprived, missing our laptop, and pissed at the hostel we decided to go and watch the Football game at a bar and try to salvage our day. This turned out to be great fun. We were still traveling with the same guy who we met in Nice, and he was very into football. 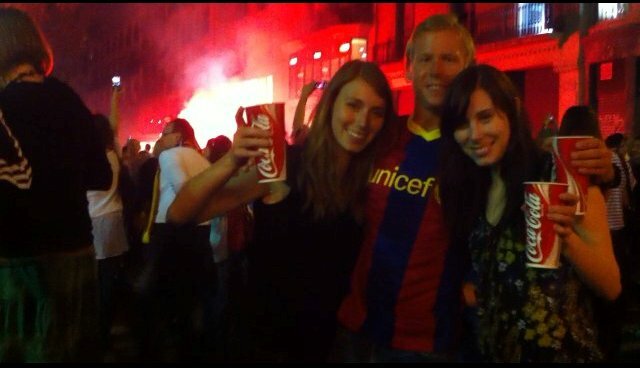 We caught a cab after the game (Barca won!) and headed downtown for some celebrations. Let me tell you, I have never been in such a crowded city before. Everybody was in the main downtown square cheering, drinking, setting off flares, climbing light posts, and peeing on things. 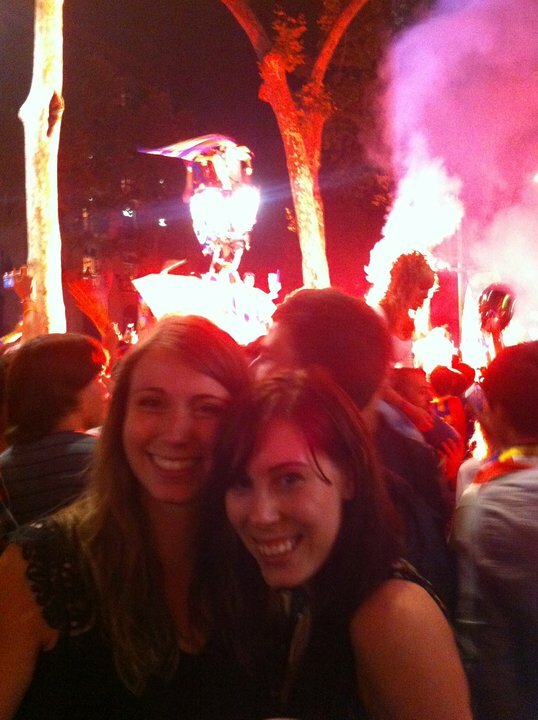 It was the biggest public celebration I've ever seen and we met many other travelers enjoying the fun. Below you can see people behind us climbing light-posts and setting off fireworks. This was, of course, in the middle of a political upset in Barcelona, so although we were having fun, I felt anxious and wanted to leave around 3am. My sister begrudgingly came with me, but the fellow we were traveling with had gotten separated in the crowd and the public transit was closed. Getting a cab at a time like this, when everyone else is trying to get home- Almost impossible! luckily we found one and made it back to the hostel. The next morning we learned that there was been several riots, the police had shown up and there was some violence. Apparently this is fairly normal for Spanish football celebrations, but I felt a bit justified that we had decided to leave. 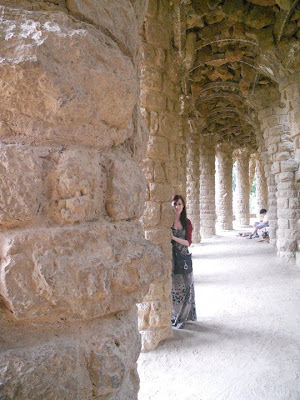 The rest of our visit in Barcelona was much calmer. We started locking the zippers on our bags, We were very careful about pickpockets, and we had a much more pleasant stay after that. 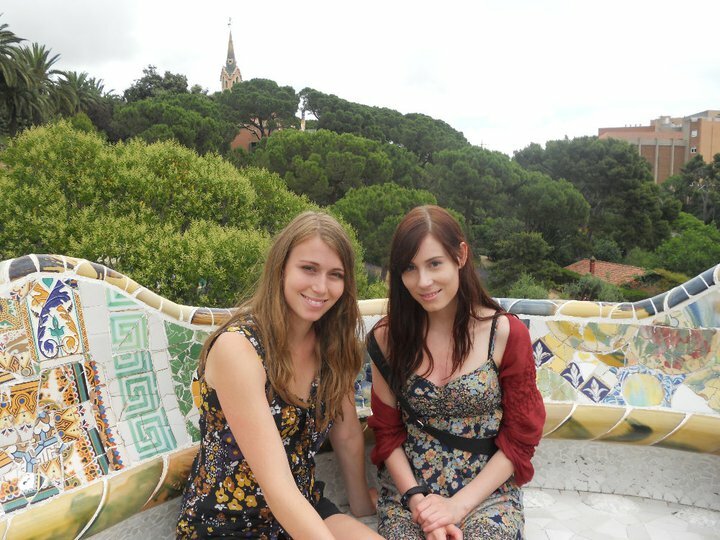 We visited Parc Guel, took a bike tour of the city, and ate a lot of Tapas. We went to the beach and I sustained a ridiculous sunburn, so bad that many locals pointed and pretended to warm their hand over my legs on the subway home. Lovely. I immediately bought a maxi dress and wore that for the next week, so that would be why in every picture, I have the same outfit on. Whoops! 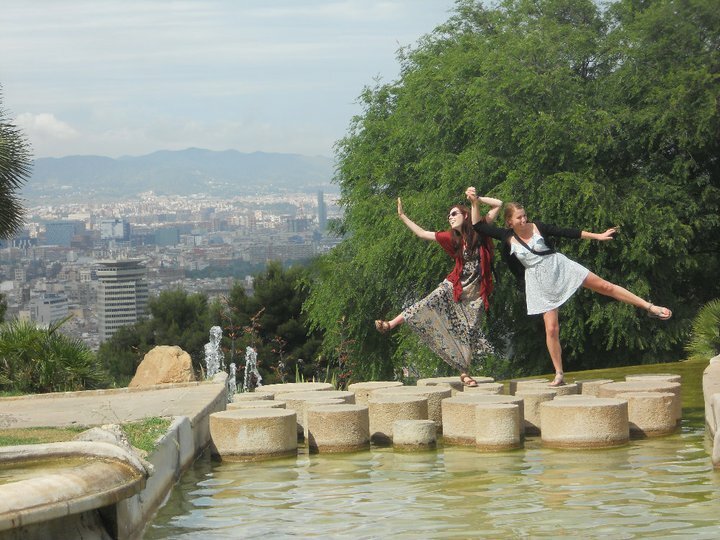 All in all we had fun in Barcelona, but I learned a few hard lessons while there. Almost everyone we met had a story about how they were pick-pocketed, so we didn't feel too silly about learning the hard way, but if you ever visit Barcelona, be warned! Thanks so much for stopping by! Next week I'm sharing my adventures in Madrid, Spain. Hostels are the absolute worst for pilfering jerks. It's so annoying, and the fact that they are becoming increasingly expensive, a lot of times it is just cheaper to get a cheap hotel room if you are traveling with other people. It's the worst feeling to get something stolen, so sorry you had to go through that! Sorry about the laptop stealing, that's really rubbish! But, I'm glad it didn't take away from your trip enjoyment. Pickpocketing aside, it's cool that you got to visit there! Ah, lovely Barcelona! Everyone that I know has been there says I need to go! Although parts of your trip there were a little bit scary at times, it looks like you had a wonderful time :) I want to go! !